webFUTURES believes that our clients should enjoy the privileges of a high-powered Web site. Therefore, we believe in bringing the site to life! In order to create an exceptional Web product, we take advantage of the state-of-art technologies. webFUTURES works closely with you to develop rich, informative Web content and Stylesheets. We design your Web site with an overall theme that reflects your company's image and vision. We are also able to maintain the content of your Web site, working to continually improve, update and enhance it at your request. 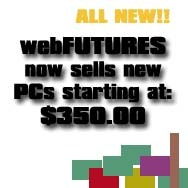 We give you options -- with webFUTURES, you can choose from one of our pre-packaged options, or choose to have us create a custom-designed Web site. With our customized designs, we will provide you with a written, fixed-price proposal for a customized Web site design.